Most homeowners consider their home to be the best place in this world. It’s the place where their heart belongs, so why not make it as comfortable and beautiful as possible. Interested in adding a bit of style to your house? Consider the potential of the enduring beauty and utility that rustic iron decor items can add to both the interior and exterior of your home. Decorating with the some of these classic wrought iron home décor items can add a timeless quality. Rustic iron décor offers you such a broad spectrum of products and applications. Right from your living room to your backyard, from your bedroom to your kitchen and bath, you can find beautiful, sturdy and useful items that will delight the eye and have lasting value. Aside from the main home décor items, you can also add various rustic wrought iron accessories. Among the main pieces of wrought iron rustic furniture, you have an incredibly wide choice; patio furniture, coffee tables, beds, dining tables and settees, to name but a few. Not only are the foundation pieces of your decor available, but accessories like chandelier extensions, wrought iron chandeliers, candelabra, candle wall sconces, media storage racks, baskets, wine racks, pedestal tables, towel holders, curtain rods, side tables, kitchen accessories and fireplace tools are also available. For Christmas decorating, holiday accents include reindeer, snowmen, Santa Claus figures and angels. For the most part, European styles are preferred, the designs being classic and elegant. Delicate, leafy and floral cuts are among the most common. If “Country French” is one of your favorite motifs, you will find many items that will complement that style of decorating. Yet wrought iron is also a basic design element in Craftsman or Mission interior and exteriors; one of the basic tenets of that style was that the beauty of simple, yet well crafted pieces, especially those made by skilled artisans, was superior to the over-decorated, over-embellished and busy style of the Victorian Age that preceded it. Wrought iron accents, when kept to the more basic applications, also add panache to a more modern form of decorating. And it’s probably not even necessary to add that if your home is a historic one, wrought iron accents are imminently suitable. Aside from the choice of styles, you can also choose from many custom color variations. You can also choose from a wide range of elegant lawn and garden rustic iron home décor products, including iron gazebos and pavilions, trellises, arbors, obelisks, flower boxes, plant stands, planters, bird feeders, birdbaths, and hanging plant containers. There is something about wrought iron fencing and gates that will never get old, or be considered passe. With its minimal upkeep and sturdy construction, there is no other type of fencing that can hold a candle to it; the posts will never rot like wood, it is impervious to wind and weather conditions and so far as longevity goes, again, it has no equal. Decorating a home using these accents is an “in” thing today. Rustic iron home décor offers durability, style, and elegance with affordability. Decorating homes with wrought iron has a long history and it remains popular even today. As any gardener will tell you, the mark of a beautiful garden is not only it's variety of flora but also the lawn accessories that serve to accentuate the overall look. A well made wire garden fence will not only help keep plants in check, but will also help your garden look beautiful and pristine. As an added bonus, a fence will protect your plants for large critters who have a habit of chewing on more beautiful plants. As gardeners have discovered, in many cases, beautiful equals tasty for deer and bunnies, especially tulips and rosebuds. The first decision that needs to be made when choosing a garden fence is the material. There are hundreds of wood and metal varieties that can be used to build a stable fence, and the correct material depends on your garden's environment. If you live in a area with tough climates such as high winds or strong storms consider investing in a fence made of metal, particularly one made of strong iron or steel. On the other hand, if your garden is located in an area with relatively mild climates, a light metal fence with wooden fence posts would be more than adequate. Selecting the height and area of a garden fence is one of the most important decisions when choosing a wire garden fence. In order to ensure adequate coverage, it's important to go a little bigger than needed. Plants can sometime grow taller and wider than anticipated, and leaves that hang over a fence can become damaged from animals or the elements. Similarly, the coverage area of a fence should be a bit wider than your garden space. Giving the plants a bit of room to breath is wise, and having the option to plant more if needed is also very convenient. After choosing the correct size and material for your wire garden fence, the final (and fun) step is choosing the look of your fence. The style of the fence should match your garden's overall aesthetic, and serve to elevate the beauty of your plants. Some go for a more traditional style that places function over form, while others prefer high end and ornamental designs. While the typical wire fence, with the standard rectangle-shaped design is serviceable and effective in keeping wildlife from grazing on ornamental landscaping and vegetable gardens, there are some very pretty forms of woven wire fencing that can be very attractive, and put you in mind of a fence that might have graced your grandma’s garden, along with whimsically designed gates that are downright decorative. Whatever you choose, make the process fun and exciting! So there you have it, a few tips to keep in mind when purchases a garden fence. Again, the most important aspect of a fence is its material, so make sure you select something that lines up with your needs. Keeping the above tips in mind will lead allow you to select a fence that will last for years and years. Many people look at their gardening as more than yard maintenance, or more than even a hobby--but a decorative art, a way to make their home look happy, pretty, and inviting. There are, however, challenges that go with gardening as well. For instance, it is very difficult, if not impossible, to make a garden look complete without outside decorative garden borders. Of course a border for a garden can be homemade--using wood or the like--but there are many downfalls to this approach even for the most seasoned gardener. First and foremost, one has to consider the longevity of this kind of border. Even specially treated wood lends itself exposed to all the elements, and will show it. This will eventually lead to a rotting, heavy, and cumbersome mess. A wooden garden border is not nearly as visually appealing as their decorative wrought iron or steel counterparts. Even if the wood is of high quality, and made to look appealing, it will never show the sheer class of wrought iron decorative garden borders--an appealing reminder of 19th century garden art. When considering any metal decorative garden border there are a lot of facets to consider--there are many custom options from sizes, styles, finishes and overall set ups to meet any needs. This is another positive to metal decorative garden borders--there really is something for everyone. Very often these wrought iron pieces are thematic, and can either be paired by the theme of the home, area around the garden, or even just a personal preference. Many of these pieces interlock to allow unlimited area for the garden, in addition to maximum coverage. These interlocking border pieces can range from ankle height--mostly variations of small hoops--to being as high as three to four feet. In addition to the small interlocking pieces which can have their own ornate designs, the larger garden borders give larger selections when it comes to design. For instance, there is a New Orleans-style fence that is very simple in design--it is also in the same height category as the extremely more meticulous tradition Fleur De Lis-style fencing. Even for the gardener on the budget, a wrought iron decorative garden border can be obtained. Although many of these fence pieces can cost up to around $100 a piece, more simple designs can be obtained in the $30 range. For the more creative gardener, different style pieces can be paired to give the maximum dramatic effect--or just to spruce up an existing decorative border. There really is no limit to garden borders when using decorative pieces. There is also no replacement for decorative garden borders when it comes to style, beauty, and sophistication. Landscaping is often one of the best features of a home. A beautifully landscaped yard can provide hours of enjoyment, as well as add extra living space to a home. Trees, flowers, and other plants are all an important part of the landscape, as are more permanent decorative and functional items such as a landscape trellis. Adults, children, and pets will all benefit from a nicely landscaped yard. A landscape trellis can be made from a variety of materials. Those materials can include, but are not limited to, wood, bamboo, and metals including wrought iron. Wrought iron is heavy, but is easy to maintain, and can be painted easily. It is also very durable, and lasts for years. A wrought iron landscape trellis has the look and feel of your grandmother's garden, but you don't have to shop at an antiques store for one. There are still artisans who will make new ones for you in a variety of styles. Often gardeners will install a trellis near the house to give the impression that plants are growing up the wall. However, trellises can essentially be used anywhere in the landscape. Once the gardener picks a spot it's important to make sure the trellis is properly installed using brackets and holes dug at least six inches deep. Once the trellis is properly installed, the gardener needs to decide what, if anything they want to grow on the trellis. In a flower garden, there is a plethora of flowering vines that can be grown up a trellis. However, a trellis does not need to be used only in a flower garden. There are many fruit and vegetable plants that can also be grown on a trellis. Cucumbers, gourds, and pumpkins all grow well on a trellis. Grapes can be grown on a trellis, and there are hardy kiwi vines available. Next to a house, climbing ivy is a classic choice. The gardener should consider if they want a perennial plant, one that will come back year after year, or an annual that will need to be replanted each year. Perennial plants can be costly, but feature lower maintenance year after year. Annual plants have a lower upfront cost, but need to be replanted each year, so may cost more in the long run. Nice landscaping can add untold enjoyment and value to any home. Whether it is decorative or functional, a trellis is a beautiful and long lasting addition to any landscape. Install your trellis, and enjoy the benefits! The lasting beauty of statues has echoed throughout time since mankind first discovered that we can mold hard substances into everlasting creations. The ancient Egyptian, Roman, Greek and Persian empires are just a few of the nations who, despite being gone from the world, have left timeless monoliths behind that serve as testaments to the greatness of their people. Here in the United States of America, we are following their example by putting in place monuments such as the Statue of Liberty and Mount Rushmore. These incredible statues are works of art that leave onlookers in awe and while you may not have the resources to have a hundred foot tall sphinx dropped off in your backyard, you can have your own yard molded into a true work of beauty by investing in the right garden art statues. When decorating your garden or yard you add trees, trim the grass, spread mulch, pave paths, lay stones and plant bushes. Adding a great collection of garden art statues, though, will create an ambiance that will transform a backyard haven into a serene work of art. The right statues can turn a boring cluster of shrubs into a woodland adventure, make a simple fountain seem like the center of a Roman promenade, turn a strip of pavement into a storyboard, or turn a bland patch of dirt and rocks into a stylish postmodern getaway. Not only will garden statues add a fitting touch to the look of your garden, they are also long lasting. Unlike most other garden art pieces, they require little to no care and they will last several lifetimes. Most other types of garden art require trimming, watering and other forms of maintenance to maintain their health and beauty. You can also take the statues with you if you ever decide to relocate. Even the largest art statues are mobile enough to be moved away should you decide to keep them. Trying to relocate your botanical garden art, on the other hand, requires the exhausting task of digging up deeply buried roots and carries the risk of the plants dying en route. When considering how to best turn your garden into a serene world that you will always be happy to come home to, you should browse the world’s endless collection of garden art statues to find what you are looking for. Iron garden benches can add a relaxing English garden touch to an outdoor area. A long lasting material, iron used for iron garden benches will last the test of time. With many options to choose from, a garden bench will be sure to add that special touch to make the garden area shine. There are many garden benches people use in their garden areas. There are wood, metal, iron, and plastic to name a few. Wood is definitely cheaper than iron, but it won’t last long, unless a homeowner plans on spray painting it with Kilz every few months – especially during rainy season. Plastic is the flimsiest of the benches and will definitely suffer in the heat. Metal is another option but won’t add that special touch that iron would add. By choosing to have an iron bench in the garden, homeowners will be choosing quality and style for their yard. Making sure the iron bench chosen is made to withstand the elements is very important. The different types of iron include ones made by extrusion, casting, or forging/welding. Welded iron is the best kind to get. Cast iron is probably the worst kind for iron to choose in a garden bench. Cast iron is very brittle and will not stand the test of time but with proper care, it is possible to manage it enough so it will last years. Iron garden benches are made in many various designs. If there is a butterfly garden, iron benches can be made so that the backrest is a giant butterfly design. If a garden or yard area is made to look rustic, then there are iron designed benches that can add to the rustic appeal. Many garden benches can have backrests or be left as simple benches. Decorative pillows can also be added to an iron garden bench to make it comfortable. 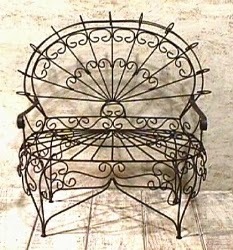 Having a unique design on a iron bench can be created by a welder. Otherwise, there are many online companies, department and hardware stores that will carry a few various designs. Choosing to add an iron garden bench to the garden area is sure to please everyone. Not only does it add a special touch to the garden, but it also provides a place of comfort on hot, sunny days. With a variety of benches to choose from, a bench addition to the garden will be certain to add charm and beauty to the yard. Wrought iron has a grainy texture similar to wood and is incredibly durable. Prior to the advent of steel, many things were made from wrought iron, including nails, chain, rails and pipes. Today, wrought iron is commonly used for producing garden furniture, guardrails and fencing. If you're looking into wrought iron yard fences and gates as an option for your home, chances are durability and security are important to you. Wrought iron yard fences and gates offer a beautiful and incredibly durable option for your home. Unlike wooden options, wrought iron does not need paint or stain maintenance on a regular basis. The issues that can arise with wrought iron are very minimal and easy to handle on your own. If rust appears, washing the fencing followed by use of steel wool and wax will quickly get rid of it. Other minor issues that can occur with wrought iron is squeaking. This can be taken care of easily and quickly with occasional oil on the troublesome areas. Wrought iron yard fences and gates are elegant, handmade and extremely long lasting. They come in many different styles and can complement any design style. From simple homes to elaborate estates with automatic gate entry, wrought iron is an excellent option for beautiful fencing. Wrought iron fencing is see through and can allow you to showcase beautiful landscaping. But if privacy is desired, lush greenery can complement the fencing nicely. The cost of wrought iron will vary depending upon the height and width of each section. It will also be dependent upon how much custom work will be required to fulfill your design. Height options can be anywhere between two to twelve feet. As you research fencing options, consider wrought iron fencing as an alternative to traditional wood or chain link fencing. Wrought iron can add a distinctive touch to your landscaping and though it might be a more expensive option than wood or chain link, it will be a long lasting investment. Installation of wrought iron fencing is not a simple task. Unless you are an experienced DIYer and are willing to do the research necessary for proper installation (some online companies offer how-to videos), consider hiring a professional company to properly install your fencing. Call reputable and professional companies and ask them to provide you with a quotation. Browse their portfolios of previous work and read customer testimonials to ensure you are comfortable working with the particular company. You can research design ideas on various sites online to help you determine what you would like for your home.